Kids – they’re such a treasure. One minute you’re having a nice chat, the next minutes they’re testing your knowledge of the natural world with a question like, “Why can we see the Moon during the day?” And before you know it, you’re building a CNC Earth-Moon orbital model. We’ve got to applaud [sniderj]’s commitment to answering his grandson’s innocent question. What could perhaps have been demonstrated adequately with a couple of balls and a flashlight instead became an intricate tellurion that can be easily driven to show the relative position of the Earth and Moon at any date; kudos for anticipating the inevitable, “Where was the moon when I was born, Grampa?” question. The mechanism is based on the guts of a defunct 3D-printer, with the X-, Y-, and Z-axis steppers now controlling the Earth’s rotation and tilt and the Moon’s orbit respectively, with the former extruder drive controlling the tilt of the Moon’s orbital plane. A complex planetary gear train with herringbone gears, as well as a crossed-shaft helical gear set, were 3D-printed from PLA. The Earth model is a simple globe and the Moon is a ping-pong ball; [sniderj] is thinking about replacing the Moon with a 3D-printed bump-map model, a move which we strongly endorse. The video below shows the tellurion going through a couple of hundred years of the saros at warp speed. There’s just something about machines that show the music of the spheres, whether they be ancient or more modern. And this one would be a great entry into our 3D-Printed Gears, Pulleys, and Cams contest too. An orrery is a clockwork model of the solar system, demonstrating the machinations of the planets traveling around the sun in a sublime pattern of epicycles. A tellurion is a subset of the orrery, showing the rotation of the Earth around the sun, and the orbit of the moon around the Earth. [HuidongT] created his own tellurion out of laser-cut parts and just a few bits of copper tubes and bearings. This project was originally inspired by the holzmechanik, a tellurion constructed from plywood gears and brass tube. [HuidongT] saw a few shortcomings in this project: the Earth didn’t spin and the moon didn’t orbit with its natural five-degree inclination. [Huidong]’s tellurion would have these features and include an illuminated sun, demonstrate the change of the seasons, and show lunar and solar eclipses. While there was a bit of math involved in figuring out the gearing, it’s not much: the Earth would go around the sun every 365.25 days, the moon would go around the Earth every 27.32 days, and there is a difference between sidereal and solar time. A quick script made quick work of the math, and anyone can easily find tools to create gears given a diameter and the number of teeth. The fabrication of this tellurion was made with acrylic on a laser cutter with a handful of 3D printed parts. The electronics are simple enough — just a motor and a few LEDs, and the completed project works well enough. You can check out a video of the tellurium below. 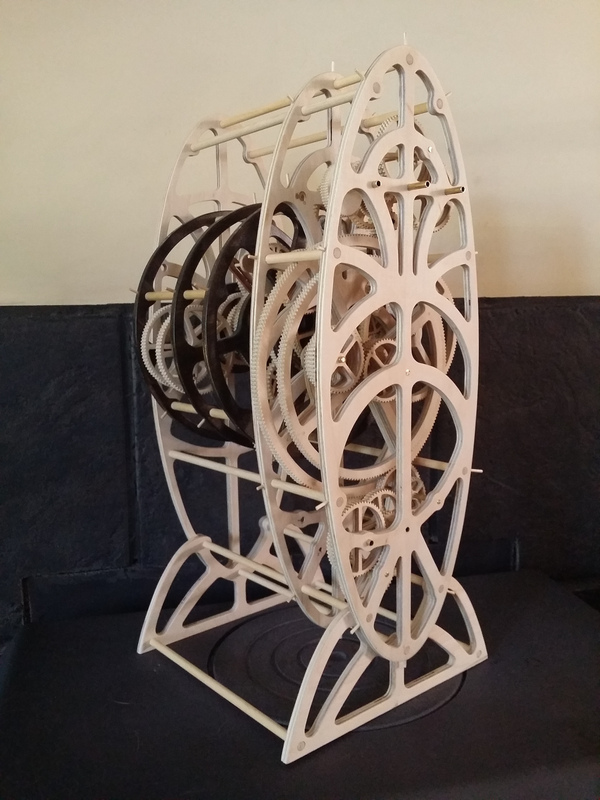 [Dave] builds custom wooden orreries, which are mechanical models of the solar system. It’s no surprise then that he’s interested in the Antikythera Mechanism—a small geared device discovered off the coast of the Greece in 1900 that is believed to be the first analog computer and one of the oldest known geared systems, built partly to predict the positions of celestial bodies in the solar system as it was understood in ancient Greece. [Dave] decided to build a wooden version of the Antikythera Mechanism as a proof of concept that it can be done in wood rather than the brass of the original. He also sought to incorporate all the modern theories of the device’s gear train. The entire system is made out of 6mm birch plywood that [Dave] cut by hand on a scroll saw. That’s right — no CNC or lasers here. This has as much to do with replicating the craftsmanship of the original as it does with practicality. Besides, the pitch of the gear teeth is too small to be effectively cut with a laser. There are no motors, either. The gears are centrally connected to nested brass tubing and the mechanism is actuated with a hand crank. The six pages of forum discussion are worth combing through just to see the pictures of [Dave]’s progress and all of those meticulously hand-cut gears. It took [Dave] the better part of two years to complete this work of art, and you can see it in motion after the break. With the first version complete, he has begun Mk. II which will feature all of the spiral dials and pointers of the original. If you’re interested in exploring the Antikythera Mechanism further, here is Hackaday’s own in-depth look at it. What in the heck is an Orrery? If you’re looking at the image above we’re sure you’ve already figured it out (kudos to the big brains that knew the word). For those that don’t get it, an Orrery is a mechanical device that represents the movements of planets and moons. We never thought of building one ourselves. After seeing the machining process for what’s shown above we’re not sure if we’re excited, or scared off by all the work that went into it. You might want to bust out the Chromecast and hit the sofa for this one. There are dozens of YouTube videos showing the build. From cutting sheet stock into round slugs, to making teeth, teeth, teeth, and more teeth it’s not just the gears that go into this one. You’re also going to needs the orbs themselves. We have fond (perhaps scary) memories of the first time we saw an Orrery as a part of the set in The Dark Crystal.